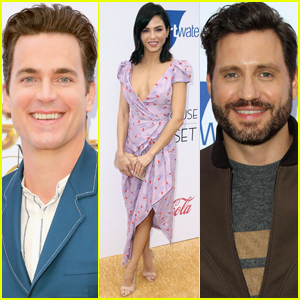 Jenna Dewan Joins Matt Bomer & Edgar Ramirez at Gold Meets Golden Event! Matt Bomer suits up for the Gold Meets Golden party on Saturday afternoon (January 5) at The House on Sunset in Beverly Hills, Calif. The 41-year-old actor was joined at the event by fellow actors Edgar Ramirez, Daniel Bruhl, and Billy Porter. Actresses Jenna Dewan, Chrissy Metz, and Emmanuelle Chriqui stepped out in style for the party. Olympic ice skaters Michelle Kwan, Adam Rippon and boyfriend, Jussi-Pekka Kajaala, along with Maia and Alex Shibutani were also in attendance. FYI: Matt is wearing a Victor Li suit. Jenna is wearing a Carolina Herrera dress and Giuseppe Zanotti shoes. Edgar is wearing a Zegna jacket, a Brunello Cucinelli sweater, Aquatalia shoes, and a Cartier watch. Billy is wearing a Kenzo suit. Guests sipped on bubbly from J sparkling wine. 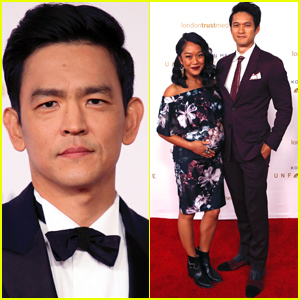 John Cho, 'Crazy Rich Asians' Cast & More Honored at Unforgettable Gala 2018! John Cho and Harry Shum Jr. are being honored for their work! The 46-year-old Searching star and the 36-year-old Crazy Rich Asians actor and his pregnant wife Shelby Rabara were among the many attendees at the 2018 Unforgettable Gala, Kore Asian Media’s annual Asian American awards ceremony, celebrating creativity, diversity and growth, on Saturday (December 8) at the Beverly Hilton in Beverly Hills, Calif.
Harry was also joined by Crazy Rich Asians novelist Kevin Kwan and co-stars Kheng Hua Tan, Lisa Lu, Chris Pang and director Jon M. Chu, who also received an award. Crazy Rich Asians was honored with the Vanguard Award. The evening was hosted by Jeannie Mai. D’Arcy Carden, Debra Messing, Descendants star Dianne Doan, Dorothy Wang, Crazy Ex-Girlfriend star Vincent Rodriguez III, Judith Hill and The Good Doctor‘s Tamlyn Tomita were among the presenters. Agents of S.H.I.E.L.D. star Ming-Na Wen, Aquaman actor Ludi Lin, Megan Lee, Lindsay Price, Fresh off the Boat‘s Lucille Soong, Hudson Yang, Forrest Wheeler and Ian Chen, Inanna Sarkis, Jenny Yang, Apolo Ohno, Ally Maki, Alex and Maia Shibutani, Sara Sohn, Searching star Michelle La, Eugene Lee Yang, Desmond Chiam, Skyscraper star Bryon Mann, The Good Place‘s Manny Jacinto, Derek Mio, Sherry Cola, I Feel Bad‘s Sarayu Blue, Joanna Vanderham, The 100‘s Kelly Hu and Runaways star Lyrica Okano were all in attendance at the event. FYI: Sarayu is wearing and carrying Tadashi Shoji and wearing Hearts On Fire jewelry. Isla Fisher Joins Ellen Pompeo & Lena Waithe at Refinery29's 29Rooms! Ellen Pompeo met up with friend Lena Waithe at Refinery29‘s annual 29Rooms exhibition! The duo stepped out at the kickoff event on Tuesday night (December 4) at the Reef in Los Angeles. They were also joined at the party by Isla Fisher, Awkwafina, Kerri Medders, Hannah Simone, Arden Cho, SZA, JoJo and ZZ Ward. Other attendees included Ariel Winter, her boyfriend Levi Meaden, Chloe Bennet, Keegan Allen, Maia Shibutani, Katherine McNamara, Lilimar, Georgie Flores, Anne Winters, Jade Pettyjohn and Harry Shum Jr.
FYI: Awkwafina and ZZ are both wearing Novis. Hailey Baldwin & Winnie Harlow Support 'Tommy Hilfiger' in Tokyo! Hailey Baldwin showed her style while stepping out for Tommy Hilfiger‘s latest fashion show! The 21-year-old model hit the carpet at Tommy Hilfiger Presents ‘Tokyo Icons’ on Monday (October 8) in Tokyo, Japan. “Tokyo was lit 🔥 Feels awesome launching my designer collection in Japan. The energy was dope! 🇯🇵 #tommyxlewis #iconsoftomorrow,” Lewis wrote on his Instagram after the event. Vanessa Hudgens, Emily Ratajkowski & Jennifer Morrison Live It Up at Netflix's Emmys 2018 After Party! Vanessa Hudgens and Emily Ratajkowski strike a fun pose together while attending the 2018 Netflix Primetime Emmys After Party at NeueHouse Hollywood on Monday (September 17) in Los Angeles. The 29-year-old Second Act actress and the 27-year-old model were joined at the event by Jennifer Morrison, Malin Akerman, Sophia Bush, Regina King, Black Panther co-stars Daniel Kaluuya and Letitia Wright, Ben Platt, Zoey Deutch, GLOW‘s Jackie Tohn, RuPaul, Michelle Visage, and 13 Reasons Why stars Tommy Dorfman and Katherine Langford. Also in attendance at the after party was Benedict Cumberbatch, the cast of Queer Eye – Tan France, Bobby Berk, Antoni Porowski and Karamo Brown – The Crown‘s Claire Foy and Matt Smith, Iron Fist‘s Finn Jones, Godless‘ Michelle Dockery and Jessica Sula, John Mulaney, Rosanna Arquette, The Shib Sibs – aka Maia and Alex Shibutani, Altered Carbon‘s Dichen Lachman, Jonathan and Drew Scott, Bob Saget and wife Sherri Kramer, and Katt Williams. FYI: Vanessa is wearing a SemSem dress. Malin is wearing a Cushnie dress. Sophia is wearing alice + olivia by Stacey Bendet. Malin is wearing Chloe Gosselin shoes. Netflix's 'To All the Boys I've Loved Before' Cast Attends Premiere! The cast of the new Netflix movie To All the Boys I’ve Loved Before strikes a pose at the premiere! 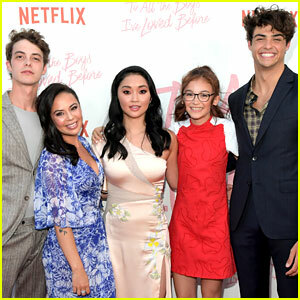 Israel Broussard, Janel Parrish, Lana Condor, Anna Cathcart, and Noah Centineo hit the red carpet at the special screening and after-party held at Arclight Cinemas Culver City on Thursday (August 16) in Culver City, Calif. They were joined by their co-stars Andrew Bachelor, Emilija Baranac, Jordan Burtchett, Trezzo Mahoro, director Susan Johnson, and Jenny Han, who wrote the best-selling YA novel the film is based on.